The principle of noise control of this system is to add an entirely reverse sound wave upon original sound wave. SNB can freely adjust setting up for maximum effect. Possible to reduce a noise level by 10db, which is far efficient than a previous system. Heightening of people expectation for the new age noise control system as an environmental measure. 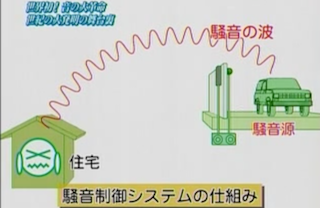 The number of complaints on noise in　Japan is 16,215 in 2004 and increasing　these years. As noise source, claims　relating to factory noise hold 34.8%, and construction site noise holds 28.7%. In　recent years, low-frequency noise also　becomes a big problem. Depending on damage level, noise problem becomes public nuisance putting on trial. 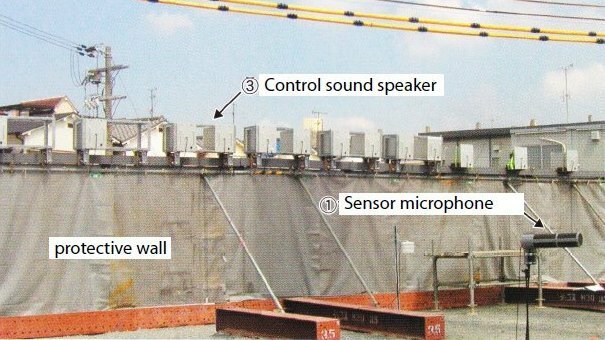 Factories and construction sites prepare anti－noise equipment such as a soundproof wall or noise barrier, but complaints on noise may arise depending on sound level and frequency. Recently SNB (Active Noise Control) technology has been adopted into noise cut headphone and system to make automobile room quiet. Super Noise-barrier is one of these ANC technology united with noise barrier to reduce outside noise. Reduce noise level adding artificial sound with opposite phase wave upon sound from the noise source. 1．Measure impulse response An of the pass from the noise source to microphone and　control area over the barrier. 2．Measure impulse response B of the pass from control sound speaker to control　area and decide the reverse phase wave. 3．Execute real-time convolution integration in the control unit and controlling the target area.